Fernand Léger (18811955) was a French painter, sculptor, printmaker and film director. 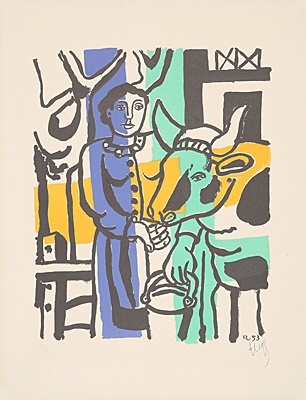 His art was initially influenced by Impressionism, later strongly by Cubism (Pablo Picasso, Georges Braque). Characteristic for Léger is the use of geometric forms (such as cylinders, cubes, cones) and the sharp contrast of colours. After the First World War, still under the influence of the war experiences, his mechanical period began, during which Léger dealt with technology and urban industrial landscape. During the Second World War, the artist spent time in exile in the USA; during this period, his works dealt primarily with the world of labourers. In addition to painting, he created monumental art, as well as mosaics (church in Assy, Savoy) and stained-glass windows (church in Audincourt). His style is characterised by a reduced formal language, which uses striking and contrasting colours. Through the combination with mechanical or technical elements, such as gears, screws or crankshafts, the person he depicted also appears to be a mechanical being. His works were shown posthumously three times at the documenta, as well as at the Fondation Beyeler in Riehen. In 1925, he created murals for the famous Pavillon de l'Esprit Nouveau, the building designed by the French architect Le Corbusier for the Exposition des Arts Décoratifs. His figurative-geometric style and modern themes later influenced the artists of the Pop Art scene.